← DOWN ABOUT YOUR LIFE? CHECK OUT “THE MINX” ON READ SHORT FICTION! WHAT IS IT WITH MELANCHOLY BUNNIES ANYWAY? The "sad bunny" I found at Michael's Crafts. Spring is here (pretty much), so why is this bunny crying? That’s what I asked myself too when I found him on a shelf at Michael’s. As is typical of any visit to that store, I go in for one thing—like magnet paper or cardstock for my chapbook covers—and I come out with some interesting current-Holiday item (with the exception of Halloween, where I come out with like four or five awesome current-Holiday items). I walked in and saw a shelf crammed with bunnies—bunnies festooned in grapevines, bunnies hugging colorful Easter baskets, bunnies surrounded by their babies. All of them smiling. Cute, I thought, I could use something new for spring. But none of these bunnies inspired me enough to part with $3.99. I was about to give up when, at the very back of the shelf and clearly set apart from the throng, I spotted one I thought I hadn’t seen yet—all I saw was his back end; somebody had faced him to the wall. I reached for him, and there he was: alone, depressed, sobbing into his little paws. This I had to have. It was perfect for me and inspired memories of every sad bunny story I read as a kid: The Velveteen Rabbit, Watership Down, and my personal favorite, Martin Bell’s “Barrington Bunny.” In that one, what I consider to be one of the saddest stories ever, Barrington tucks his smaller friends under his tummy to keep them warm during a brutal winter storm. In the morning, his friends emerge from beneath his dead body (my parents figured the fact that Barrington is a Christ figure made the horrifying tale perfectly appropriate for a three-year-old). I took him home, thinking about what had intrigued me most: someone had not only banished him to “the corner of shame,” but had also turned his sad little face to the wall. Apparently in Retail Bunny Land, sad is bad. This extends to the real world, too. How many times has someone either told you to stop crying, forced you to stop crying or else, or shamed you enough the last time you did it you either hide it or don’t do it at all? I think we just don’t frame the act of crying properly. Crying is a release, an act of cleansing. We always feel better after we do it—shouldn’t that tell us something? Besides, it isn’t always sad. Sometimes, it’s joyful. 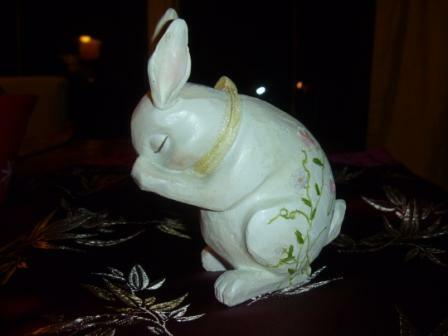 Poor sad bunny will sit on my dining room table this spring and serve as a reminder that sometimes, a good cry does the trick—and that’s nothing to be ashamed of. Posted on April 5, 2011, in Deep Thoughts & Fun Stuff and tagged Cleansing, Easter Bunnies, Spring. Bookmark the permalink. 6 Comments. Thanks, Gail! It is soooo great to hear from you! Hope you have fun when next you go to Ptown and say hello for me! I feel the same way about our over medication of depression. I’m not talking about serious clinical depression, but the subtle ennui that permeates many people’s lives at some point or another. This kind of depression, like tears can be a cleansing, a process to uncovering truths about one’s self, or a sign pointing us to learn the root of a problem. Instead, medication masks the depression and prevents one from actually understanding one’s self truly. Medication can even, in its immediate lifting of a depression, prolong suffering in such a way to make it become a debilitating clinical depression. Sometimes it is okay to feel sad, to wallow in misery for a time, we all need to go through such things periodically. I couldn’t agree more, Tony. Sadness and pain are part of what brings us through to the other side — it’s not necessarily so that we can let go, but so that we can hold on to something new when the time comes. I wouldn’t have traded any of the heartbreak in my life at all, looking back on it, because I know now that those are the things that lead me to where I am today. I feel bad for people who shut themselves down because they’re too afraid.